Yama also known as Yamarāja in India, Yanluowang or simply Yan in China, and Enma Dai-Ō in Japan, is the lord of death, first recorded in the Vedas. The name Yanluo is a shortened Chinese transliteration of the Sanskrit term Yama Rājā, or "King Yama". 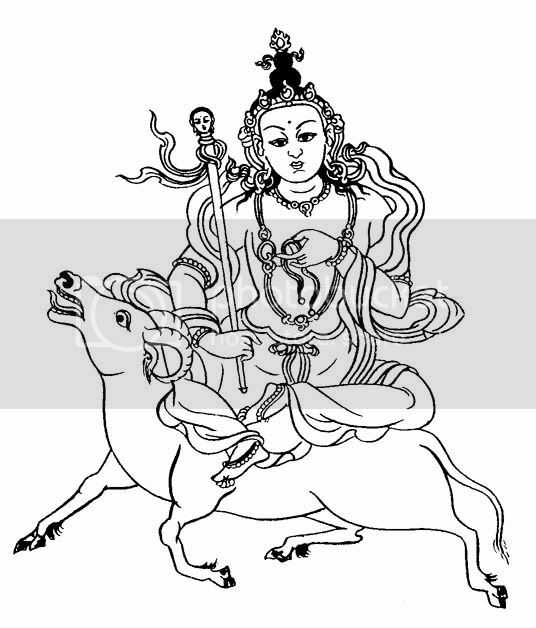 Enma Dai-Ō is a further transliteration, meaning "Great King Yama", where Enma means Yama, Enma-Ō means Yama Rājā and Enma Dai-Ō would be equivalent to Yama Mahārāja. Yama is a Lokapāla and an Aditya. In art, he is depicted with green or red skin, red clothes, and riding a water buffalo. He holds a loop of rope in his left hand with which he pulls the soul from the corpse. He is the son of Surya (Sun) and twin brother of Yami, or Yamuna, traditionally the first human pair in the Vedas. He was also worshiped as a son of Vivasvat and Saranya. He is one of the Guardians of the directions and represents the south. He reports to Lord Shiva the Destroyer, an aspect of Trimurti. Three hymns (10, 14, and 35) in the Rig Veda Book 10 are addressed to him. The Vedic Yama, with certain changes of function, was the basis for the Buddhist Yama, judge of the dead, who presides over the Buddhist Hells. The Buddhist Yama became an integral part of Chinese and Japanese mythology. Although ultimately based on the god Yama of the Hindu Vedas, the Buddhist Yama has developed different myths and different functions from the Hindu deity. He has also spread far more widely, and is known in every region where Buddhism is practiced, including Tibet, China and Japan. Naraka in Hinduism, is compared to the Abrahamic concept of Hell. However, Naraka in Hinduism is not equivalent to Hell in Christian faith. Naraka is only a purgatory where the soul gets purified of sin by sufferings. In Hindu myth, there are many hells, and Yama, Lord of Justice, sends human beings after death for appropriate punishment. Such punishment can be in boiling oil, etc. Even Mukti-yogyas (souls eligible for mukti or moksha), and Nitya-samsarins (forever transmigrating ones in Dvaita theology) can experience Naraka for expiation. Naraka is usually translated into English as "hell" or "purgatory". A Naraka differs from the hells of western religions in two respects. First, beings are not sent to Naraka as the result of a divine judgment and punishment; second, the length of a being's stay in a Naraka is not eternal, though it is usually very long. Instead, a being is born into a Naraka as a direct result of his or her previous karma (actions of body, speech and mind), and resides there for a finite length of time until his karma has achieved its full result. Chinese Di Yu, Japanese Jigoku, literally "earth prison", is the realm of the dead or "hell" in Chinese mythology and Japanese mythology. It is based upon the Buddhist concept of Naraka combined with local afterlife beliefs. Incorporating ideas from Taoism and Buddhism as well as traditional religion in China, Di Yu is a kind of purgatory place which serves not only to punish but also to renew spirits ready for their next incarnation. Jigoku is similar, with Shinto concepts. These names are interchangeable with the concept of Naraka.